Proponents of the collectivist status quo do not like a recent decision that appears to have been made by the Prime Minister of Canada. As a result, some of them are now telling us that this can mean only one thing: the PM is a tyrant, democracy is under attack, and Canada is being turned into a totalitarian state. Given the gravity of their remarks, the reader will be forgiven if he is baffled upon discovering that the decision in question was the decision to eliminate penalties for choosing not to complete the long form of the 2011 census. Given the form and content of a column by Ottawa University law professor Errol Mendes in today’s Ottawa Citizen newspaper, we are apparently meant to conclude that an elected officials’ failure to follow, or to release to the public, the advice of an unelected public servant is tantamount both to an assault on democracy and to a drift into totalitarianism. Such a conclusion is utter nonsense and, when written by a law professor, for public consumption, it is worse than nonsense. Before getting on with the substance of Mendes’ column, let me set the context by quoting from Episode 6 of the brilliant BBC educational comedy, “Yes Minister”; an episode titled “The Right to Know”. In this first scene, the equivalent of a Canadian deputy minister, by the name of Humphrey, is upset and is speaking with the relatively new and naive Minister’s secretary, Bernard (who is, like Humphrey, a part of the public service). 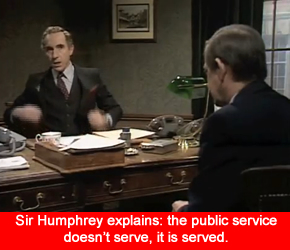 Humphrey: Would you say that the Minister’s starting to run the department? Bernard: Oh, well, yes indeed. Actually, things are going pretty well, actually. Humphrey: No, Bernard. When a minister actually starts to run his department, things are not ‘going pretty well actually’. They’re going pretty badly. Bernard: But actually…I mean, in fact, isn’t it the minister’s job to run the department? Humphrey: No, Bernard, it’s our job. Or, to be more precise, it is my job, for which I’ve had 25 years experience and training. Don’t you realize what would happen if we allowed the Minster to run the department? Humphrey: Well, in the first place, there would be chaos, naturally, and in the second – which is much more serious – there wold be innovations! Humphrey: Public debate! Outside scrutiny!! Humphrey: Is that what you want?! Bernard: Good heavens, no! I mean, but what should he do then? Hacker: I beg your pardon? Humphrey:You are not here to run this department. Hacker: I think I am. The people think I am too! Humphrey: With respect Minister, you are…they are wrong. Hacker: And who does run this department? Hacker: Oh. I see. And what am I supposed to do? Humphrey: We’ve been through all this before. Make policy, get legislation enacted and, above all, secure the department’s budget in cabinet. Hacker: I sometimes think the budget is all you really care about. Humphrey: Well it is rather important minister. If nobody cared about the budget, we might end up with a department so small that a minister could run it. Hacker: Humphrey, are we about to have a fundamental disagreement about the nature of democracy? Humphrey: Nooo, Minister. Merely a demarcation dispute. Democracy and demarcation. Two worthwhile debates that – as the cordial manner of Humphrey and Hacker demonstrates – need not devolve into hypocritical, partisan, frothing at the mouth. Need not, but nonetheless sometimes do. The proper role of the federal public service is to provide fearless advice to the government on policies that are critical to the future of all Canadians. The government has the right to decide whether to accept that advice or reject it and then to expect the federal public service to loyally implement the government’s policy decisions if they are lawful. What the government can’t do, if it does not want to torture Canadian democracy, is to force public servants to develop and promote policies they do not accept as in the interests of Canadians, and then pretend the public service is fully supportive of the ideologically driven policies. That’s false. If a public servant does not “accept” a government policy, he is not doing his assigned job. It does not matter whether or not he, because of his own ideology (all policies are, by their very nature, ideological), thinks the “interests of Canadians” would be better served with a different policy. If he decides he wants to keep his job – which implies a decision to carry out the duties of that job – the very fact that he has made the decision to do the job necessarily implies that he is, in his official capacity, “fully supportive of the ideologically driven policies” of the government. And, if he is so supportive, the government does not “pretend” by saying that the public servant “is fully supportive”. If the public servant decides that he does not want to be “fully supportive of the ideologically driven policies” of the government” then his own interests are in conflict with those of the elected government. In a democracy, if the government’s decision is final, that conflict of interest implies he must resign from the post. I can only suspect that that is exactly why Munir Sheikh felt it necessary for him to resign from the post of Chief Statistician. This is not the first time the government has sought to undermine the critical task of the public service to provide fearless advice. There is no allegation, and no evidence, that anyone prevented Munir Sheikh, or anyone else at Statistics Canada, from carrying out the “critical task of…[providing] fearless advice”. We do not yet even know what communications Sheikh made to his Minister, much less whether or not the advice was followed (and, much much less, whether or not the advice credibly can be called “fearless”). And, even if the advice was not followed, that does not mean that someone prevented Sheikh from providing the advice. Mendes’ is a straw man argument, in this respect, and smacks of partisanship. It is primarily in totalitarian regimes that there is little use for an independent public service, or judicial or quasi-judicial bodies that seek to promote the public interest regardless of politics. Listing public servants within the executive branch along side quasi-judicial servants falsely implies that deputy ministers and chief statisticians are akin to, and have the same independence required by, judges. Such is not the case. Quite unlike chief statisticians, judges don’t provide advice: they lay down law. Unlike chief statisticians, judges do not take orders from ministers of the executive branch. In our democracy, a public servant in the executive branch is not “independent” of the elected officials comprising the government. Responsibility for all policies and implementations of a Ministry falls squarely on the lap of the Minister, who is an elected official. The assignment of responsibility to an elected official ensures that the voter has a way of controlling government to some extent; a way of punishing or rewarding government for making the policies its public servants implement. The public servant who advises the Minister is, for the most part, not accountable to the public. He/she advises but must obey the Minister if the electorate is to retain the power to reward or punish the government, and thereby to ensure that the country remains democratic. In addition, the Prime Minister’s Office vets almost all external communication, resulting in Canadians not being able to test the fearless advice offered by public servants against the destructive ideologies of perhaps Canada’s most ideologically driven government. Mendes is suggesting that the public service has, or should have, a role akin to Her Majesty’s Loyal Opposition: holding the government to account for its policies. That is certainly not the case. If a public servant reporting to a Minister has policy ideas that run contrary to those of the government, he tells the Minister, not the public. The public servant does not have the right or responsibility, while in office, of holding a press conference and telling the public that he thinks the government ought to be adopting his policy proposal. To the contrary, both before and after he leaves office, he has an obligation not to communicate confidential information to the general public and other third parties. Her Majesty’s Loyal Opposition is elected not by coincidence, but by design. In a democracy, just as the electorate has the power to reward or punish MPs who form or support the government, it also has the power to reward or punish opposition MPs over their criticism of, or opposition to, the government’s policies. When an opposition party criticizes, opposes, or blocks a government bill that is supported by a plurality of voters, the electorate – in a democracy – must have the power to punish the opposition; to take away from the opposition some or all of its power to criticize and oppose government policy. In other words: the electorate must have the power to reward the government with more seats (possibly, with a majority) when and if it believes that naysayers are standing in the way of good policy. If, as Mendes suggests, the public service were to have the role of publicly opposing government policy by promoting policies contrary to the a government’s popular policy decisions, the electorate would have no way of punishing the public servant for standing in the way of what it believes to be good government policy. Maybe it’s just me, but with over-the-top claims that Sheikh’s advice to the minister was “fearless”, and that the current government is “perhaps Canada’s most ideologically driven government”, Mendes’ column appears to be little more than the result of a partisan fit over frustration that his own ideology differs from that of the government. In other words, he appears frustrated with the fact that his own ideology differs from that of millions of voters who elected MPs forming the current government. It is therefore not surprising that the essence of his objection is that an unelected public service should have the role of disclosing and thereby promoting its own policy proposals to the public; of thereby opposing government whenever the government adopts policies contrary to those promoted by the public service. This implies that there should be a class of opponents of government policy who are funded by taxpayers who are denied any means of rewarding (with more power) or punishing (by the removal of power) said opponents. In other words, it implies that public servants should not serve the public, but lead it. Far from being a defence of freedom and democracy, Mendes’ stated views about the public service are, in my view, both pro-tyrannical and anti-democratic. The irony is, who would have thought the Liberals would put themselves in the position of being FOR anything relating to mandatory disclosure to the state of so many individual facts about your personal, unique situation in life, under threat of fine and jail? The only thing more surprising about this is that the Conservatives are against it (the state using their power over individuals to get the information they want in such an institutionalized way), and want to voluntarily give up some of the governments power in this case. Even Jack Layton and the NDP are uncomfortable with this, as he suggested a compromise would be to remove the threat of jail time in this situation. But isn’t that all Harper and the Conservatives were trying to do in the first place? So the NDP and the Conservatives are against jail time, and the Liberals are for fines and jail time and mandatory disclosure. It’s either very ironic, or the Liberals have once again tricked themselves into defaulting themselves into this postion. I know the information provided by a mandatory census is valuable to all sorts of people and groups and levels of government. I’m sure there are many things that are valuable in this world that all sorts of people and groups and levels of government want, but how exactly are these groups going to obtain these things? Voluntarily? How about if that doesn’t work? But maybe this is different because it’s neccesary for the good of so many different groups and people. The good of the group trumps the rights of the individual. Well I’m sorry but if I’m in a group I know whether I feel comfortable or not, and if I don’t feel comfortable in a certain situation and the good of the group argument comes up, in retrospect I question what boudaries were broken or do I have any rights in this situation. I’m asking the statisticians and economists and politicians to keep their unwanted, uncomfortable questions off of me thank you. SUMMARY DENIAL of access to 99.99985% of all Canadians! So is this: “…under the current legislative scheme, legal access to medicinal marihuana is practically unattainable for those [patients] who desperately need it”. A point that has not been discussed is that those millions of people who “could receive a benefit from cannabis” are NEVER addressed in the MMAR, as the MMAR was designed with “terminal conditions ALONE” in mind. Basically, if you are one of the millions of people who would benefit from cannabis, cannabis-based, cannabis-infused or cannabis concentrates or extracts as medicine, and you’re not “dying or under immediate threat of death”, YOU DON’T QUALIFY! This results in at least 90% of those who would obtain a benefit from medicinal cannabis being summarily denied access!